Here is another great moment in A.P. history. In its quest to become the RIAA of the newspaper industry, the A.P.’s executives and lawyers are beginning to match their counterparts in the music industry for cluelessness. A country radio station in Tennessee, WTNQ-FM, received a cease-and-desist letter warning from an A.P. vice president of affiliate relations for posting videos from the A.P.’s official Youtube channel on its Website. See update below. You cannot make this stuff up. Forget for a moment that WTNQ is itself an A.P. affiliate and that the A.P. shouldn’t be harassing its own members. Apparently, nobody told the A.P. executive that the august news organization even has a YouTube channel which the A.P. itself controls, and that someone at the A.P. decided that it is probably a good idea to turn on the video embedding function on so that its videos can spread virally across the Web, along with the ads in the videos. I was on the phone arguing w/ AP today. 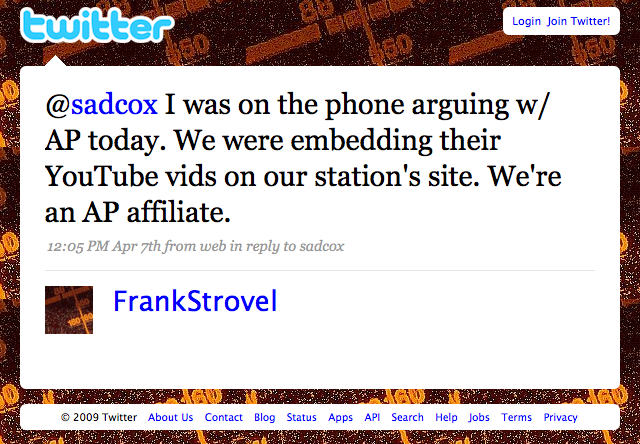 We were embedding their YouTube vids on our station’s site. We’re an AP affiliate. They asked us to taken them down. 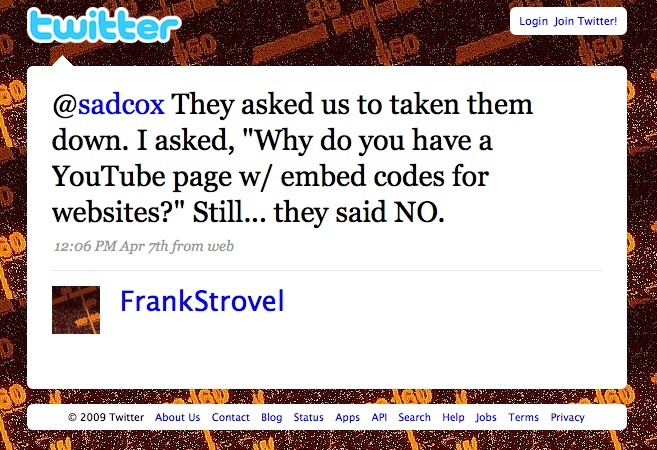 I asked, “Why do you have a YouTube page w/ embed codes for websites?” Still… they said NO. Strovel: And we’re an A.P. affiliate for crying out loud! I stumped him on that one. . . . What is really shocking is that they were shocked that they’ve got a YouTube channel that people are embedding on their Websites. He seemed shocked by that. ‘Oh, I am going to have to look into that” is what he told me. Strovel: I know, I know. 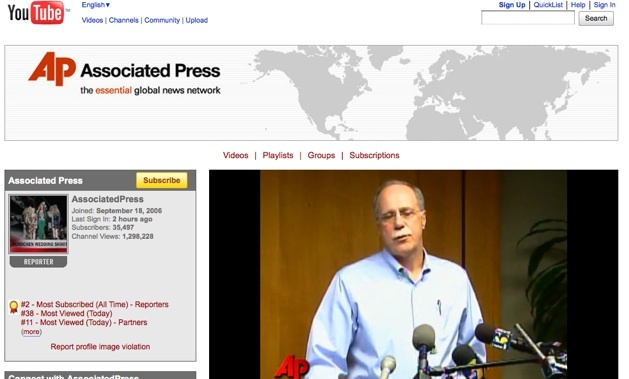 Strovel had to pull down all the videos from his Website. In other words, at the same time it was threatening the radio station it was trying to convince the station to use its “more extensive online video services,” OVN, when all the radio station really needs is what the A.P. already makes available on YouTube. The A.P. continues to amaze me. It just managed to shoot itself in the same foot twice.